Remember getting your first dark-skinned doll? As adults, we all want the kids in our lives to grow up surrounded by images that reinforce their own self-image. Even a baby recognizes faces at a young age, so why shouldn't the face looking back at her look more like she does? This package comes with three sheets of removable vinyl stickers that can stick to almost any interior surface, such as walls, mirrors, and glass, and will instantly add personality to any girls room decor. Gorgeous illustrations of three young African-American mermaids that are perfect for the daughter, niece, cousin, or grand daughter in your life. These marine-theme decals can be placed as bedroom wall art and repositioned numerous times without damaging most surfaces. Best used on a flat, non-textured, clean wall. All designs by Larissa Marantz. Larissa began her illustration career when she left The Rugrats animated TV show and instead drew the funny little characters at home for Simon Spotlight Publishing. In between numerous play dates, and hundreds of diaper changes, she illustrated almost a dozen books for Nickelodeon's licensed properties. A member of SCBWI, she currently illustrates what she knows best - living with children who make her laugh and give her countless gray hairs. A portion of each sale of the Black Mermaids Vinyl Wall Decals goes to the National Black Child Development Institute in the USA. NBCDI is a trusted partner in delivering culturally relevant resources that respond to the unique strengths and needs of Black children around issues including early childhood education, health, child welfare, literacy, and family engagement. Copyright Cuties Like Me. Sold exclusively by Hubbards East Trading Co. Ltd. Products sold by the Cuties Like Me brand are original, as described, and no other sellers are authorized to sell our products. Our shipments are USA-based and will be with you in days. 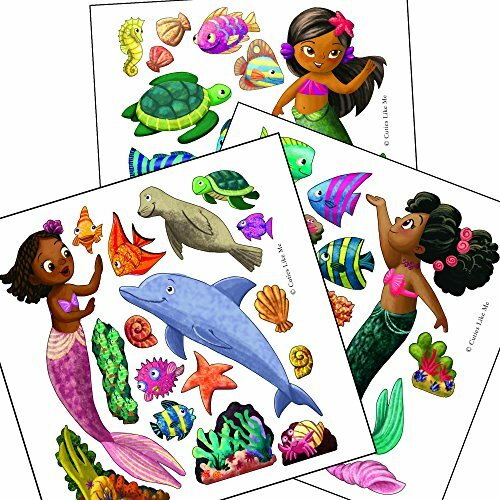 ADD DIVERSITY to any playroom, bedroom, bath room, doctor's office, hospital, preschool, kindergarten, classroom, or daycare with these adorable African mermaids and marine friends. One aquatic princess has twists, and one little queen has a puff. Familiar faces can build self-esteem, confidence, and empowerment. BEAUTIFUL TEMPORARY ART. These dark-skinned cuties can also be positioned on windows and mirrors to create fresh new under water scenes that update the look of your dorm, bedroom, bathroom. Great if you're moving in the near future as no wall repairs are needed. Won't leave marks when it's time to change your decorations. INEXPENSIVE, FUN, COLORFUL WAY TO DECORATE without the mess and expense of paint or wallpaper or damaging nail holes. As wall art for your baby nursery the mermaids and ocean friends are easily relocated as your baby grows older. Manufacturer: Hubbards East Trading Co. Ltd. Publisher: Hubbards East Trading Co. Ltd. Studio: Hubbards East Trading Co. Ltd. If you have any questions about this product by Cuties Like Me, contact us by completing and submitting the form below. If you are looking for a specif part number, please include it with your message.